서울김포영광교회는 대한예수교 장로회(백석)에 소속된 영성이 넘치는 건강한 교회 입니다. 서울영광교회는 신월1동 가로공원에 위치해 있어 양천구와 서울시 복음화에 힘쓰고 있으며 예수의 그리스도의 사랑으로 하나된 은혜의 공동체로 열방 회복을 꿈꾸며 사역하고 있고, 김포영광교회는 김포한강신도시 장기동에 대형 수영장을 매입하여 리모델링 건축을 하여 김포신도시 최대규모의 예배당을 소유하고 있고 김포 한강 신도시의 영성리더의 사명을 가지고 사역하며 섬기고 있습니다. 박영민 목사가 담임하며 사역하는 서울김포영광교회는 지금까지 신앙의 절정과 감격 그리고 영성목회로 놀랍게 성장하고 있으며 뜨거운 기도와 성령의 역사가 날마다 일어나고 은혜로운 찬양을 통하여 큰 활력과 치유와 권세를 힘입어 아름다운 영성한국을 만들고자 전진하고 있습니다. 또한 영적으로 갈급한 영혼들에게는 삶에 영성과 기쁨을 드리며 비전을 함께 이루어가는 행복이 넘치는 교회이며, 담임 목사님의 철저한 희생과 성도의 순종이 조화된 아름답고 고향과 같은 따뜻한 교회입니다. 예배의 감격과 축제가 가득한 성령중심의 교회로서 소문을 듣고 새신자가 몰려들고 있어서 한국교회 성장의 새로운 모델을 제시하고 있으며 새천년의 영성리더가 되고 한국교회 영적 심장이 되는 비전을 펼쳐가고 있습니다. 누구든지 오셔서 아름다운 신앙공동체가 되시길 간절히 기원드립니다. Seoul glory church is Presbyterian church. and, It is beautiful spot that guide new faith of 21th century information-oriented society. This church is church which many people want to go, and it is church which want to inform, and it is church which want to stay, and it is church which want to work. Our church is deep gratitude of faith. and, it is church which grow fast. Holy Spirit's miracle is occurring every day. Here is hot prayer and praise of grace. pastor is television evangelist. Worship real condition is relaid by a television and internet broadcast all over the world. Proceed to make the spiritual Korea using God's ability. Also, I want to give delight and divine nature in life to Spirit who wander immaterially. This is our vision. Thorough sacrifice of a senior pastor and obedience of attainment of perfections are accomplishing creation. It is church such as the happy and warm hometown place. t is church of Holy Spirit center and there is deep gratitude on worship. people hear rumor and people are gathering much. 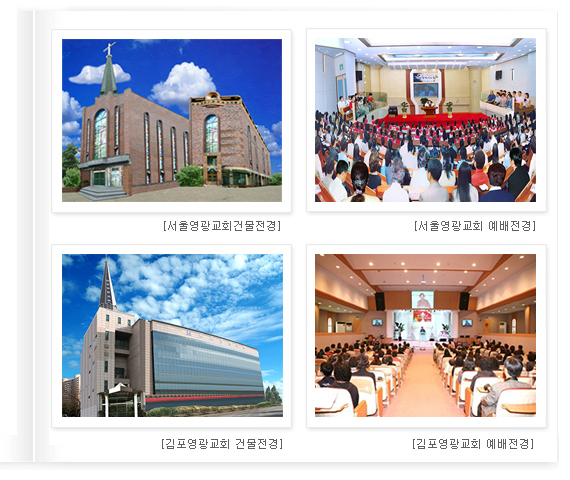 Is presenting new model of Korea church. Is spreading that become spirituality leader of new millenium and vision which get into Korea church spiritual heart. Greatly desire to accomplish beautiful faith community coming.